When I found out that JJ Cale and Eric had finally got together this was a 'Must Have' and it proved to be. It has become my background when surfing and often just a background. I think Eric found his home in the music and hope he knows there is more to come. I've listened to this CD several times now-It still makes me get goose bumps. JJ Cale & Clapton seem to turn into one individual in many of the songs-guess they must be SOUL MATES! Another great sing along with two awesome guitar players. The best blues I've heard in quite a while. Cale and Clapton! Make another one! This is the most relaxed I have heard Eric in a very long time. They finally got it right, a compilation album that compliments both artists. Ear candy, as sweet as it gets! I saw the interview on CBS Sunday morning of Eric Clapton talking about his life, his music. FAME means nothing to Eric, his lyrics etch out his tears about losing a child, and his joy in this season over his THREE LITTLE GIRLS. Cannot wait to purchase this new masterpiece which will fit the FALL season of the legend of Eric. On CBS Eric admitted that at the wise age of 61 he does not pretend to have the energy of his youth...while this new lyrical disc will mirror the season he now enjoys. A great combination of two talents, covering a large spectrum of American music paid here a very respectful tribute. No show-off, just an outstanding human touch, very classy. 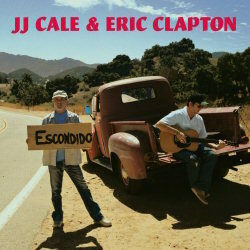 Another terrific blues from Eric (hard to thrill)& perfect soft swing from JJ Cale. It's a real bonanza for listeners when artists don't have to overdo in order to be noticed. OK, it's simply music (O! my god, they actually play with... instruments!, it doesn't pretend to start a revolution, there's no surprise for the fans but it's so good when music is only music!